Do you need to make your wedding day even more special? You are thinking of a private villa with a wonderful sunset over the Aegean sea to throw your after wedding party or a private beach area to have your pre wedding party? Have you thought to arrive in the ceremony area with a luxurious car or even a helicopter? What about vintage furniture that will give your wedding a distinctive character and warmth? 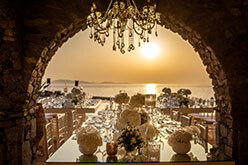 Our company, with more than 12 years of experience, has collaborated with numerous vendors and rental companies in Athens and the Greek island, and can quarantee to create a luxurious and lavish touch to your event! Please make a request to have a quote.